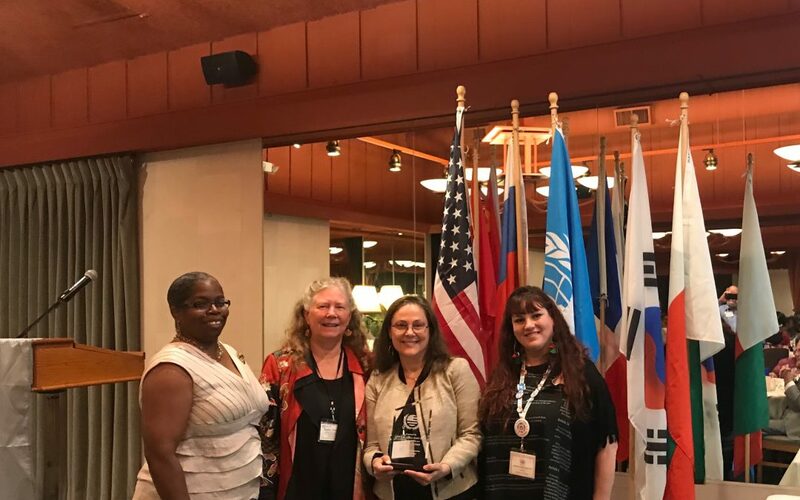 Every year the United Nations Associations honors individuals and organizations in their communities that contribute to the pursuit of human rights and justice. 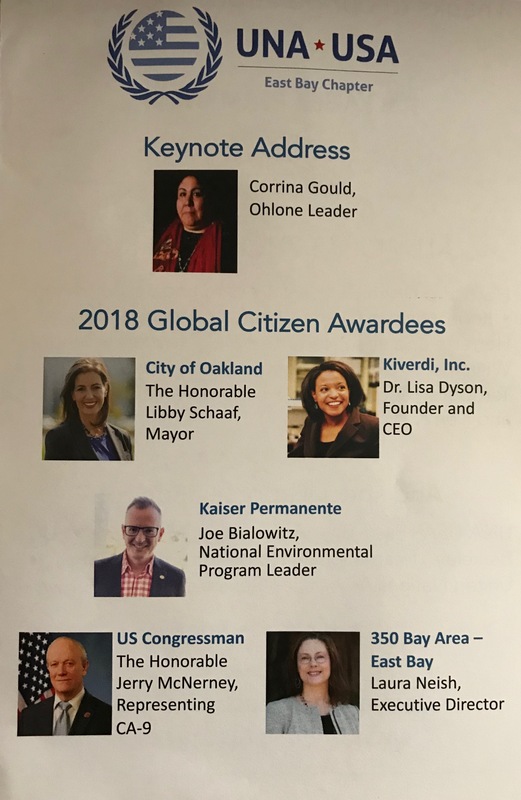 350 Bay Area and 350 East Bay are excited and honored to report that we have received the Global Citizen Leadership award from the United Nations Association’s East Bay Chapter for our work to mitigate the impacts of climate change. Laura Neish, 350 Bay Area’s Executive Director, accepted the award on behalf of 350 Bay Area’s extraordinary team of committed, talented, and effective volunteers, most of whom dedicate a truly astounding number of hours to working for all of us to insist on bold and swift action here in the Bay Area and in California. Congratulations team: well deserved! 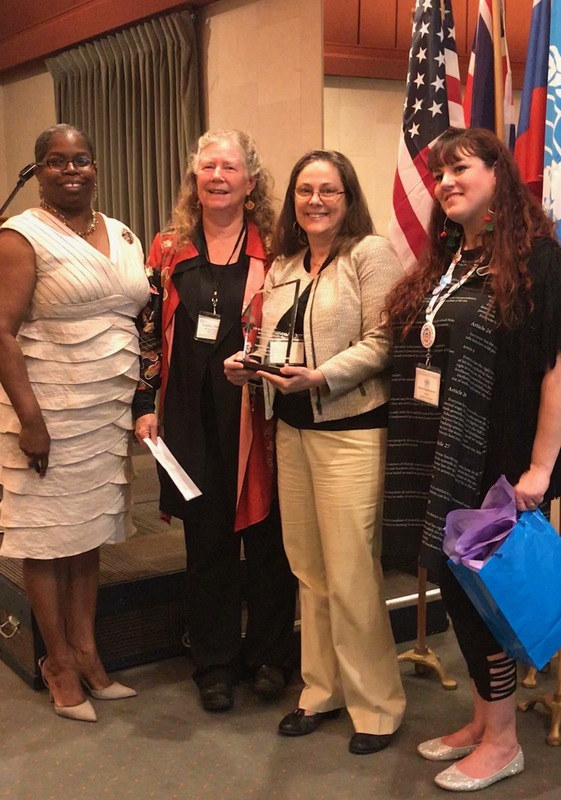 Kathy Dervin and Laura Neish receiving the award from Sandra Williams and Melinda Howard-Herrarte. The evening was focused on climate change, and Corrina Gould, an Ohlone Leader, reminded us that there was a time in recent history where the human footprint was minimal, and that we are bound to our earth and its systems for our survival. The other awardees were impressive: Congressman Jerry McNerney for his consistent support of environmental and climate issues; Kaiser Permanente for their work linking health to climate change issues, and leading sustainability efforts; Kiverdi Inc. for their work on innovative, low emission, high quallity food production; and the City of Oakland for their leadership on reducing emissions at the city level. A stable climate is a human right, as is breathable air and safe water. 350.org and its local groups and the United Nations and its Association groups share a primary goal: a sustainable and just future for all of the people of the world. Like all 350 groups, 350 Bay Area focuses on the heart of the story: to avoid catastrophic climate breakdown, we need to stop burning stuff, particularly fossil fuels, and replace those dirty sources of energy with clean ones. While we’re doing that, we need to protect the communities hardest hit by the damaging impacts of fossil fuels AND the abrupt transition away from them by enacting laws and policies that reduce emissions in a just way – at the state, regional and local levels. This award reminds us that there aren’t very moments in the arc of human history where – as ordinary people – we can make world-changing history. We are at that point in time, where each of us is called to action to solve these big complicated issues. 350 Bay Area is heartened to have a large team of volunteers and supporters that are working to create a heathy and just future.